After approximately a month-and-a-half of steel work, the big day has arrived — the topping off of Aztec Student Union. At 11:30 a.m., a steel beam will be raised to “top off” the project – it symbolizes the end of the steel erection process that began Aug. 31. This entry was posted in Construction, Events. Bookmark the permalink. Dear God, this process has dragged on and on…. and once the student loan bubble pops, this student center will go half empty for YEARS. Thank you for your comment, Strelnikov. 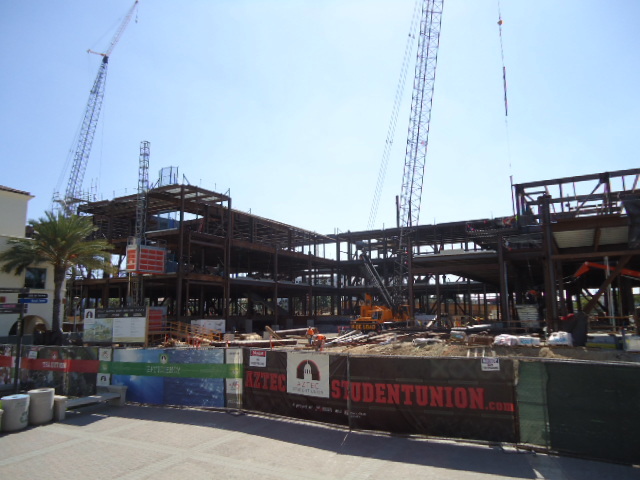 While it may seem a long time coming, Aztec Student Union is on track to open in fall 2013. You may also find interest in a recent article that named SDSU the No. 8 university in the country and No. 1 in California for least debt among graduates.